Moti Mahal is one of a number of high-end Indian restaurants in London that adds a sophisticated twist to this much-loved cuisine by incorporating some expert spicing and elevated cooking techniques. The head chef is Delhi-born Anirudh Arora who has been cooking at Moti Mahal since it opened in 2005. He draws his influences from India’s famed Grand Trunk Road, a 1,500-mile trade route between India and Pakistan built in the 16th century. The food at Moti Mahal therefore takes diners on an inspired modern food journey of India, with dishes that have its roots in regional cooking. Like the food, the décor at Moti Mahal is modern in its design. It’s very smart, with white-linen tablecloths, polished wooden flooring and gorgeous chandeliers that help to set a stylish tone. There is also an open kitchen partitioned behind a panel of curved glass which affords diners a bird’s eye view of its goings-on. Moti Mahal were offering a ‘season’ special, a tandoor baked truffle naan with vintage cheddar, cumin and white ‘Alba’ truffles (£24), something impossible to pass up. 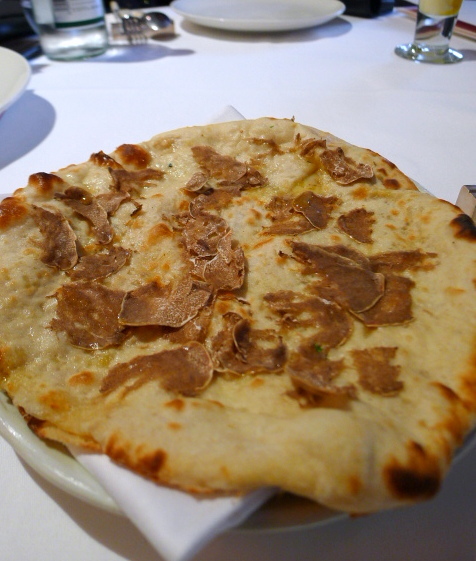 I mean how can anyone possibly resist truffle naan? It was heavenly because not only was the truffle gorgeous, the combination of the melted cheese with the warm softness of the bread was also something magical. 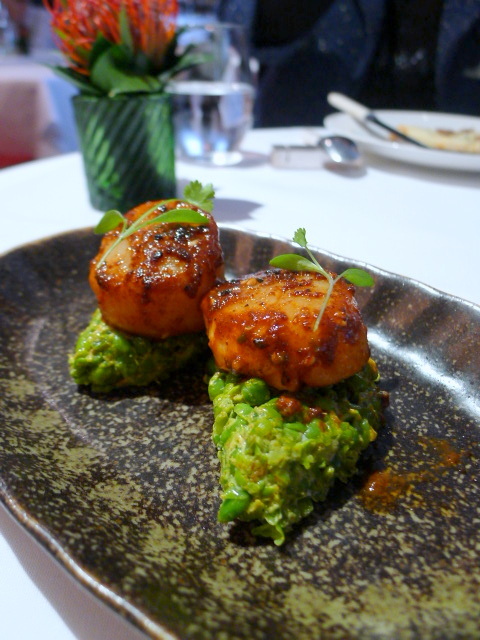 A dish of seared scallops with sesame seeds, coriander and tamarind (£14) was a thing of beauty. The scallops were juicy and plump and beautifully cooked, leaving them with a translucent quality. The spices used were magnificent and well balanced, enhancing the flavour of the scallops beautifully. Also delicious was the base of crushed lime and cumin peas which were deliciously sweet with a slight acidity to them. Crispy-fried soft shell crab flavoured with curry leaf and smoked onion seeds (£24) was also very tasty although I found them a little oily. Some soft shell dishes tend to be more shell than meat, but these were wonderfully meaty with a beautifully sweet flesh. To accompany the crab was a spicy prawn pickle which was fabulous and not too acidic and which could have easily been eaten on its own. 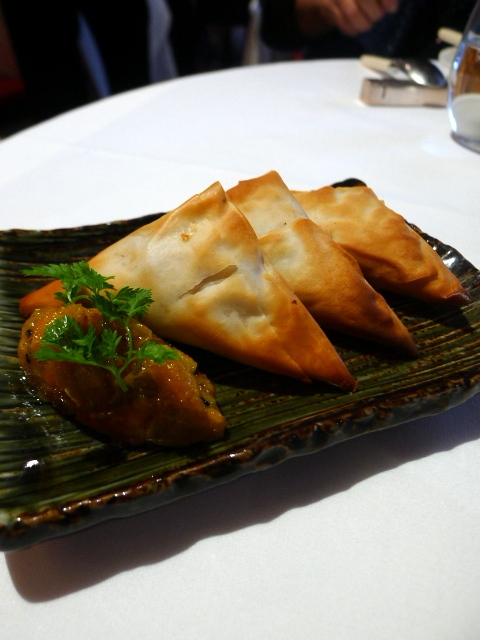 ‘Gur’ roasted guinea fowl filo samosa with pine nuts with a grape chutney (£7) were a winner. These were wonderful, with the refined filling being sweet and delicate. The filo pastry was excellent and very flaky, and the chutney was a perfect pairing for the delicious samosas. We tried a couple of items from the grills which were surprisingly slightly underwhelming compared to the rest of the meal. 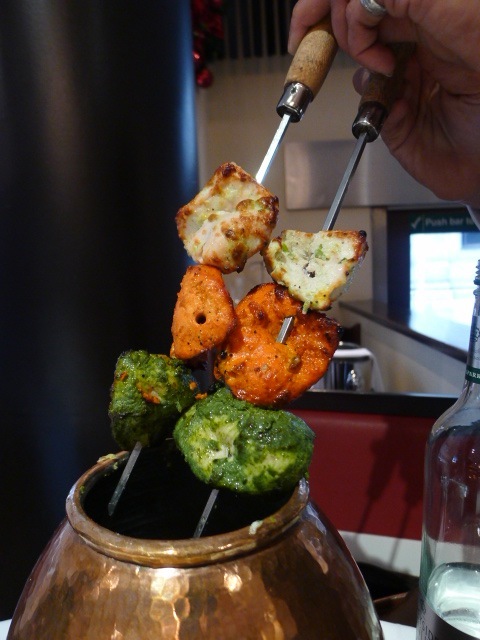 Murghi nazakat (£18) – a trio of chicken tikka from Punjab cooked in the tandoor oven was visually arresting on the eyes. The chicken was served on the skewer and each of the three pieces was prepared with mint and basil, poppy seed and Kashmiri chillies and cracked pepper and coriander root. The mint and basil was delicious, but I found the spicing on the other pieces of chicken to be a little flat and the chicken itself a little dry. 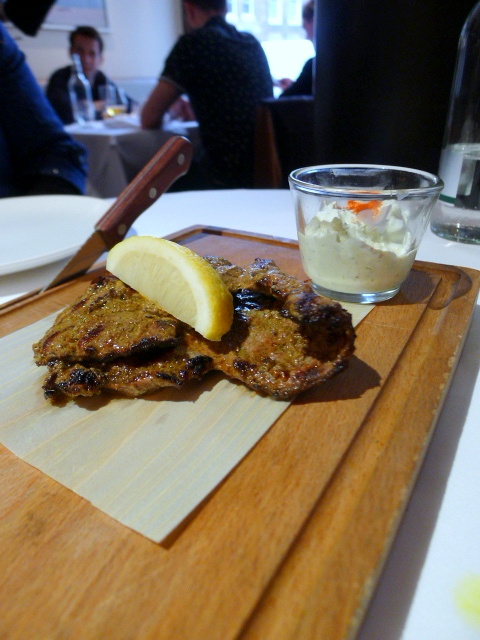 A second grill dish was the thatee grill gosht of butterflied lamb leg (£56 per kilo with the starting size being 200 gm). It had been cooked on a thatee grill and had been wonderfully flavoured with an intricate garam marsala marinade that was deep and complex. As for the lamb – it was a good cut, but it was well done. And even though I couldn’t fault the technical aspects of the dish dish, my personal preference is always for lamb to be medium rare. 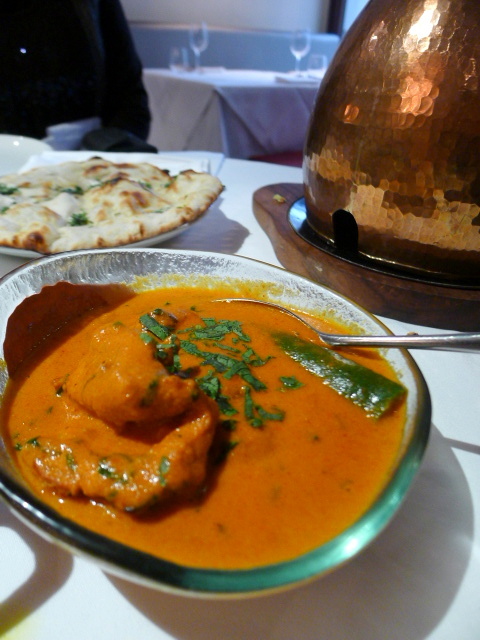 A curry of murgh makhani (£22) – butter chicken from Delhi using the Moti Mahal special recipe is one of the signature dishes at the restaurant. The sauce was creamy and smooth, with a rich tomato flavour. 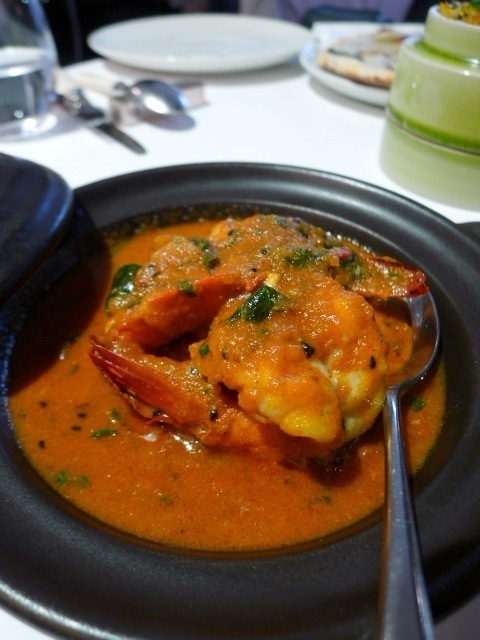 Another curry of jumbo prawns (£25) simmered in a roasted onion and tomato sauce with onion seeds and ginger was also really enjoyable. The jumbo prawns were fat and tasty, and the sauce was wholesome and satisfying from the use of tomatoes, onions and various spices. To accompany our curries, we had the slow cooked lamb biriyani (side £14, main £24) with basmati rice, saffron, ginger and cardamom and tandoori naan bread stuffed with spiced game mince (£7). Both were delicious, particularly the biriyani which was mesmerising with its intricate and well-balanced use of spices. 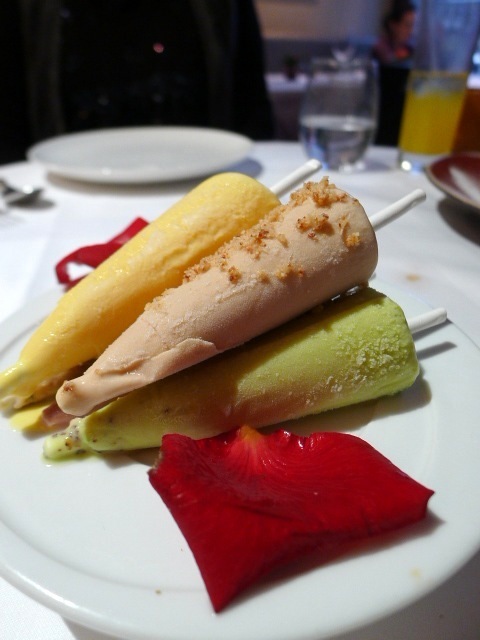 To desserts, and the kulfi selection (£11) consisted of white chocolate, mango, pistachio, blackcurrant and rose. They were all very tasty, particularly the mango. 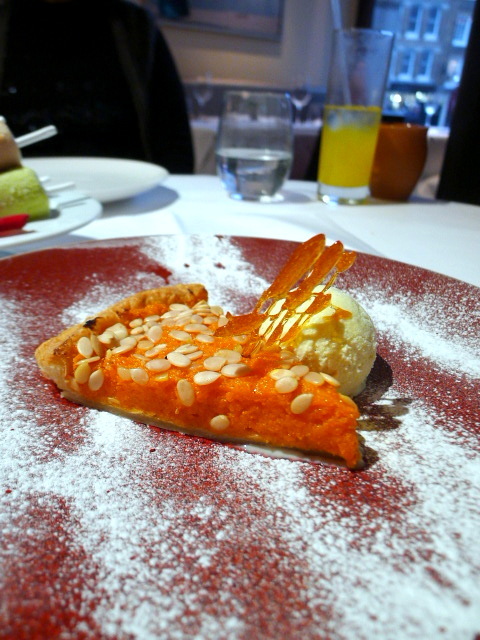 We also tried the homemade carrot and cardamom halwa tart served with clotted cream ice cream (£7). Very traditional in its preparation, it was particularly pleasing for its taste of authenticity. Moti Mahal provided us with a refined Indian dining experience, the most memorable aspect of which was the skilfulness of the spicing. Certain dishes such as the scallop dish and the guinea fowl samosas showed off flavours that were complex yet delicate, intricate yet full of sensibility. The result was taste sensations that tantalised and tickled the palate. The grills didn’t quite hit the spot, but other dishes such as the truffle naan and the biriyani were not to be missed as these were both spectacular. The service was warm and professional which helped to round off a wonderful experience. Prices are higher when compared to the standard high street Indian and reflect Moti Mahal’s Covent Garden location and business lunchtime crowd. 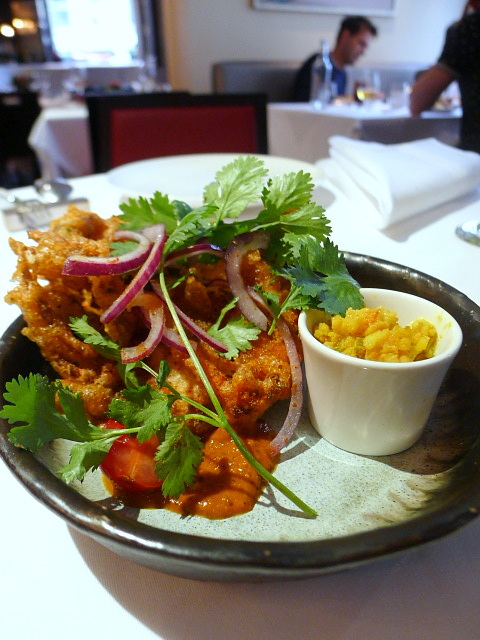 But then again, Moti Mahal is not an ordinary high street Indian restaurant. At lunchtimes Moti Mahal also offers a good value tiffin lunch. Prices: About £45 to £70 per head. Excludes drinks and service.